A legally binding contract or agreement is usually formed of written and / or verbal terms setting out, more or less precisely, what the parties to the contract intend to do. During the process of reaching an agreement the parties may also make representations of fact. For example, a retailer selling a sit-on lawnmower may tell an interested customer that he will be “the fastest gardener in the West and the envy of all his neighbours” if he purchases the GrassNemesis 5000. The contractual status of such a statement may depend on the intention of the person who makes it. If the person making the statement intends it to be contractually binding it will be a term of the contract. If he does not intend it to be binding it may be a representation. It can sometimes be difficult to determine whether a statement is a term of the contract or a representation – a trial examining the words and actions of the parties may be required. If a representation is untrue it is described as a misrepresentation and it may entitle the other party to end the contract. For a misrepresentation to result in this entitlement it must generally be shown that the misrepresentation induced the person to enter into the contract. Negligent – where the party who made it has a duty towards the other party arising out of a special relationship and, therefore, is expected to take additional care where it is foreseeable that the other party will rely on the statement. 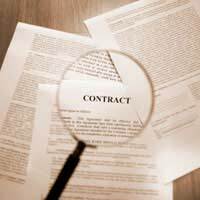 A misrepresentation may be made with the intention that it will induce the other party to enter into a contract. If it does induce the other party to enter into the contract it may then be an “actionable misrepresentation”. The party who was induced by the misrepresentation may then be entitled to a legal remedy. A misrepresentation may entitle the person who was thereby induced to enter the contract to set aside – or rescind - the contract. Alternatively a misrepresentation by one party may mean that the other party is entitled to damages. Historically, a person was only entitled to legal remedies due to fraudulent misrepresentations. Subsequently, in the 1963 case of Hedley Byrne Co. Ltd v Heller, it was decided that there could be circumstances in which damages could follow negligent misrepresentations. This would generally be where a ‘special relationship’ exists between the parties - probably due to some particular skill or duty on the part of the person making the representation. The Misrepresentation Act 1967 may give an entitlement to damages for a negligent misrepresentation unless the person who made it can prove that he believed that the representation was true and that he had reasonable grounds for this belief. The purpose of the remedy of rescission is to put the person back into their pre-contract position. Generally, a person is not entitled to both rescind the contract and to claim damages. However, they may be entitled to monetary recompense if they incurred other obligations whilst bound by the contract. A person may lose the right to rescind the contract if they discovered the misrepresentation and then expressly continued with – or affirmed - the contract. Rescission may also not be available if it has subsequently become impossible to return the parties to the position they were in before the contract. The type of damages available to a person who has entered into a contract because of a misrepresentation may depend on both the type of misrepresentation and the effect of that misrepresentation. The purpose of the damages will generally be to compensate the innocent party for loss suffered in relying on the misrepresentation. However, the test applied by the courts may vary depending on whether a misrepresentation was fraudulent, negligent or innocent – and whether the claim is brought pursuant to the Misrepresentation Act. Hi, is it possible to prove misrepresentation where is was verbal. I have a string of emails with a gym membership salesman where because I missed a promotion (due to the gym’s system being down) I asked if they would still honour it. I have in writing the salesman saying “pop in and we’ll sort something” He then verbally confirmed that he would honour the promotion but this hasn’t happened. He’s since ignored my contact and the manager of the gym is going to ask me to prove he said this. Hi, I moved to a new permanent role 3 months ago. The job description was for a new role that i had not experience with plus some elements of my previous role. In the interview they knew and they have already agreed that they knew I had not experience in this particular area. Also, the job specification included that i will be dealing with topics that I did had previous experience that this has not been the case. From the beginning that have given me very little exposure in the new area and after one letter that I drafted (in the new role/are) they said that I am not good enough and they never gave me further work nor tried to provide guidance/training as they did to another new colleague. At the meeting with the employer he said that they will let me go, however, firstly they knew at the interview that I wanted to expand my skill set in this new area, a big part of the job description was not accurate and in 3 months time they gave me only one chance to prove myself in the new area/role that I did accurately but not to the degree expected. Is there any insight/suggestion you can give me? My Case has gone to a small claims and I am preparing an appeal. Does misreprentation rule out caveat emptor. I purchased a caravan, in the advert is stated up to date with services. the seller argued that two work done sheets he though were services even though they are over one year old prior to sale.can I argue that this was a negligent misreprentation that I relied on to rule out caveat emptor. Secondly the advert stated 'this van is mint' is there any case law to support the use of the term mint and can this be regarded as misrepresentation rather than what the judge deemed sales buff. Hi, We booked our Mexican wedding at the travel agents as the coordinator gave us a price with a wedding which was £769 but she said would be free if we booked 5 rooms, we knew this would happen as had friends and family coming and as she stated we had already booked 5 rooms. We later found out that we had to pay for extras which we didn't realise were not Included, such as the chuppa and aisle runner for the beach. We emailed asking the cost to upgrade to a higher package, the assistant manager emailed back saying she checked this and the price would be £800 on top of what we were already paying. I asked to confirm whether this meant after taking off the £769 for the original package or on top of and she confirmed this. Later we received our final invoice with no discount for the £769 for having 5 rooms. I questioned this and they are denying it saying that there is a free package but this is £769. I have the email from the assistant manager and notes which I wrote down in full view of the agent where she gave me prices and I wrote them down before and after booking 5 rooms. Would the email be sufficient evidence to prove misrepresentation? I suggest you give ACAS a call in order to talk to someone directly regarding this. @ls9bg - Regulations protecting consumers from unfair, misleading or aggressive selling practices come under the EU Unfair Commercial Practices Directive. Falsely stating a product will only be available (or available through certain/specific terms) for a very limited time to persuade the consumer to make an immediate decision, comes under the banner. Please see link to the Government leaflet on the issue here. However, I suggest you seek professional legal advice regarding whether you have a case to pursue a refund. The CAB may be able to help, please see link here. I hope this helps. i was mislead into believing by aPhoto shoot company that the only photos suitable for a particular modelling agency who sent me there, were the photos taken by this particular photo studio. I paid extortionate amount of money for 5 photos because my 6 months old baby was assessed to be suitable for modelling after assessment from the test shoot (same photos)which followed the photo viewing session and unexpected photo hard selling session. One of those where you have to make the decision there and then. In the end the sales men put everything on the cd to save his time instead of making a selection of only 5. I reported this to trades standard and asked their advise , they say that it will be difficult to prove a verbal statement that the sales men made to me. I am not sure what evidence I can provide to prove that he indeed lead me to believe that I had no other option but to buy these photos to go ahead with the modelling agency. There is lot of social evidence on consumer blogs. Any piece of advice will be much appreciated. By the way I gave been offered another photo shoot as a resolution but that is not what I want I want my money back. @janedoenextdoor - I am afraid I can't answer your question as we are a UK-based website and have no knowledge of US law. However, I am not sure even in the US that you can launch a case on the back of a 'promise' that your ex chose not to keep. I wish you luck sorting your issues out. I was proposed marriage from a man in a different state. I left a job and moved in with him. He quickly made living with him unbearable within less than 3 weeks he sent me a text and demanded that I move out THAT day. He called police and my daughter and I put on the streets. She and I have spent money on hotels, and additional expenses that accrue with finding a new home. Most of my proof is my daughter and many numerous text that go between him and I. Is it possible to file civil action to regroup airfare, moving truck, gas and all expenses that have been associated with this nightmare?? If so....does it start from the beginning? As in our move to his home or only after he broke the engagement and threw us out? I was visited by a salesman who arrived unprepared to provide the full terms and conditions of contract or any form of contract whatsoever.Under pressure to accept the offer and benefit from the huge discounts on offer and going on vacation two days later I agreed that upon the production of the terms and conditions I would pay a deposit to secure the product.The full terms and conditions were not provided until 12 days later when reading the small print it became apparent that there was a cancellation period of only 7 days.This information was not given either verbally or on the photocopied front page of the signed document. My question therefore is are my rights to cancellation effective from the date that I was made aware of them or from the date of signing the photocopy of the front page which only related to price and deposit. Hi,I am trying to find information and advice on a situation that I unfortunately find myself in whereby I was misled during the recruitment process into believing that my terms and conditions of sales based commission was indeed completely different to that actually operating within the company. Based on this information given to me it proved financial viable for me to move employers but now in place I find that the actual terms do not prove so. Any guidance would be much appreciated. Concise & easy for any business person to follow.